cherry pie filling done. fudge done. still have toffee and the pie crust (and then bake the pie). I have the energy now, but I am thinking church might feel a little too early tomorrow morning. lol. 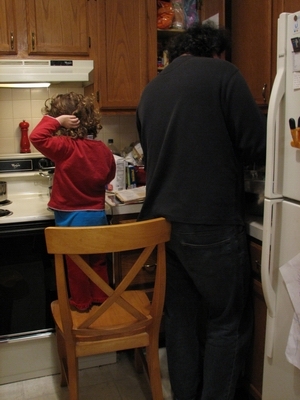 I had her use a chair as a counter to mix the ingredients. 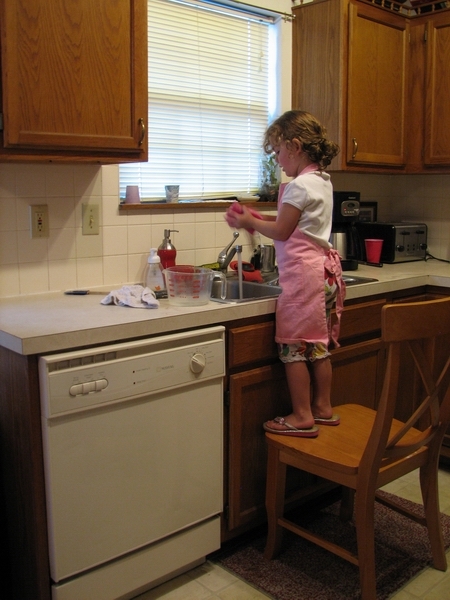 And she insisted on cleaning up afterwards. As if I would argue. I was down for the count for a good week. Fever, chills, massive sinus and chest cold, but thankfully no gastro issues. Doing the low carb thing meant that my usual sickness stand by, chicken noodle soup, was out, so I was in search of something with a similar feel that would be healing. 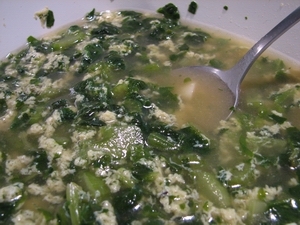 I ended up taking some chicken/bone broth, a bunch of frozen chopped spinach, several cloves of garlic, then streaming in some eggs at the last minute for some awesome egg drop soup. This, along with lots of hot tea, an avocodo and some oranges became my menu for the week. It was a good choice. I feel much better now. I do have a lingering cough, but from my understanding it may hang around for a good month or two if it follows the trend of everybody else who got knocked over with this bug. Last night was my first night back in bed with the rest of the crew and I didn’t have any coughing fits, so I think I am on the mend. So far, Zach hasn’t gotten sick at all. Zane was sick the day before I was, never had a fever, and was better in two days. Zora started coughing earlier this week, but hasn’t progressed to a fever, so she might luck out too. I am SO glad that it hit me harder than the kids. Last week at the Autism parent’s meet-up the people next to me all had the most delicious looking/smelling pepperoni pizzas (Old Chicago…what they are known for). I have been craving pepperoni pizza ever since, like CRAZY craving it. Tonight we made a substitute that, although not exactly healthy, was yummy and low carb. Crustless pizza. lol. 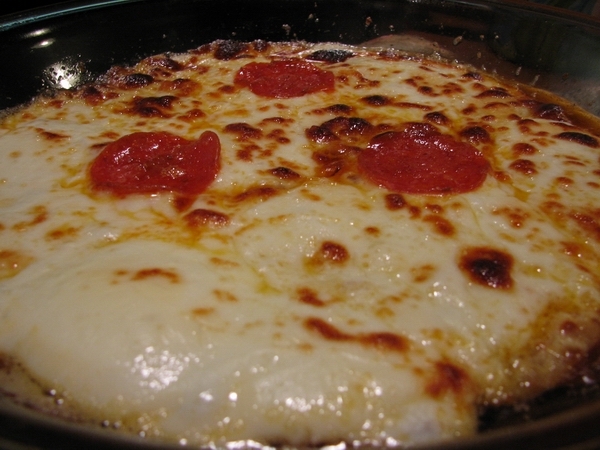 Take a pie plate, put pepperoni and cheese in it, put it in the oven until the top looks like it is supposed to, all bubbly and browned. All of the yum, none of the carbs. If we would have had tomato sauce, that would have been great as the first layer, but we didn’t, and I didn’t care, so we skipped it. My more usual daily fare is a BIG A** SALAD, taking inspiration from Mark’s Daily Apple. Earlier this fall we actually hunted down the “serving bowls” that match our wedding set and got two. I have this sensory thing that makes the sound of metal scraping metal almost intolerable to me, so eating giant salads out of my mixing bowls was about to do me in. It was worth it since we use them at least once a day, sometimes more. 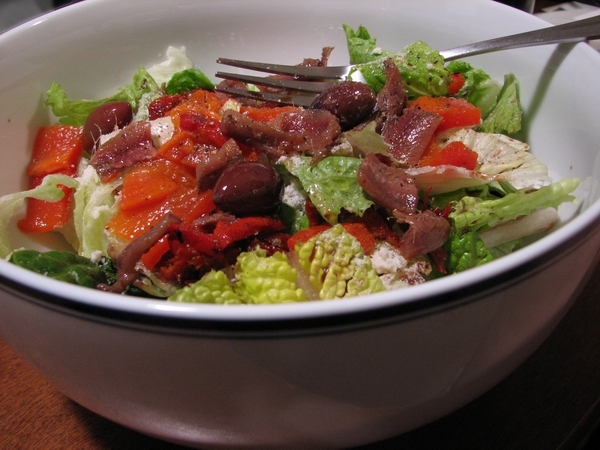 In the warmer months, a salad is easier with such an abundance of fresh veggies. As winter winds down (and so does our pocketbook), we are reaching farther and farther into the pantry and freezer to find salad fixings, but it is still quite yummy. Krogers/Dillons had red roasted peppers in a jar on a great sale a few weeks ago, and I stocked up and am enjoying at least one big red pepper on there every day, along with sun dried tomatoes and either gorgonzola or bleu cheese. Add in some anchovies, leftover chicken or meat, or sardines (although the texture of sardines makes them a little tougher to eat), some balsamic vinegar and decent olive oil and it is still a pretty good nutrition. I usually have an avocado and a bag of something from the frozen veggie section in there too (like broccoli, cauliflower or green beans), but didn’t take the time to do that tonight. I vary the greens, but my favorite is a bag of spring greens I can get for a good price at Aldis, because it has a nice variety. Throwing a bunch of herbs and spices on it also helps give it a nice depth of flavor. This is the core of my food for the day. If I get enough healthy fats in there it is amazingly satisfying. Zora helped make the fudge after she donned the apron and hat from Oma. 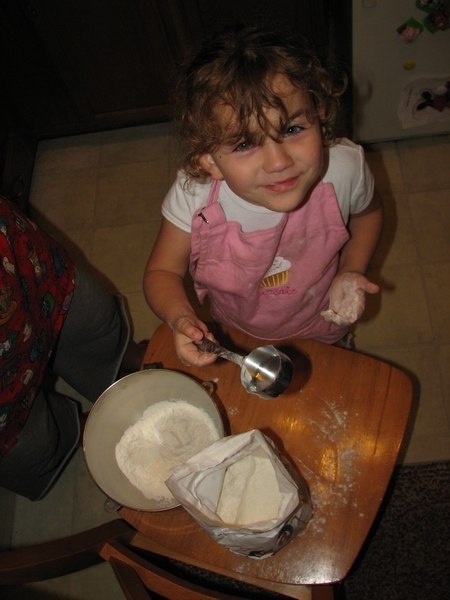 She was so excited to bake her cake, I couldn’t resist grabbing the camera to memorialize it. 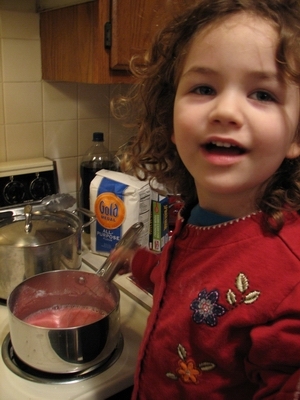 She chose Strawberry flavored cake and, although we helped her with measuring ingredients, she is the one who did most of the mixing. 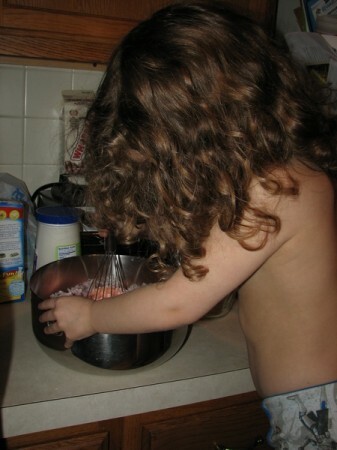 Zora helping make Thanksgiving Pies. 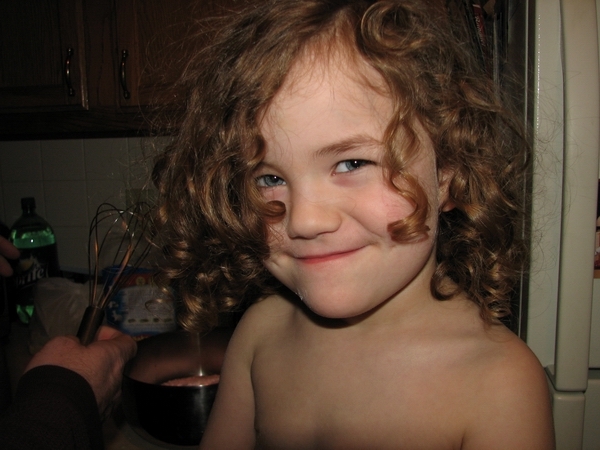 She is helping me make Cherry Pie while Zach is making the Pumpkin Pie. We also made Pecan Pie. Yum! #173: Pita Goodness. Wish I would have remembered to take a picture with them stuffed with fillings, but I was too hungry to think about pictures. Here is the last lonely pita left in after our family demolished the rest of them. These were really fun to make and will most certainly be repeated often. (would have been fast without my helper, but then, that was part of the point of making them) The mistake I made was not putting enough flour in between the bread when I stacked it up to rise, so I ended up having to remake most of the rounds and they still turned out great. I made 8 pitas from this recipe so that they would be big enough to actually get a decent amount of veggies into the pocket. -Sift together 2 cups of flour and the yeast. -Add water and salt and mix well. 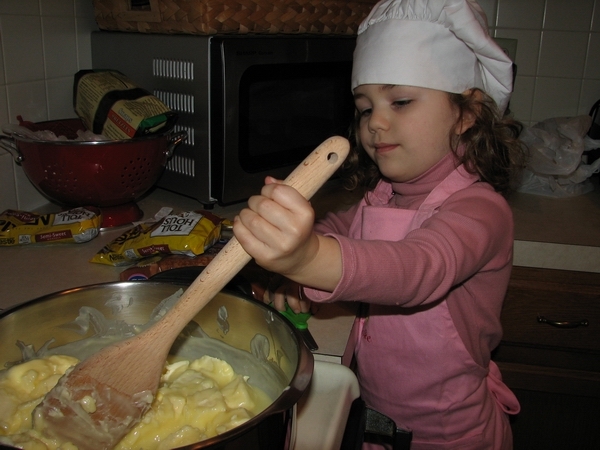 -Gradually add in the remaining flour just until the dough begins to clean the sides of the bowl. Once this happens, stop adding flour (so, you might not use all the flour the recipe calls for.). 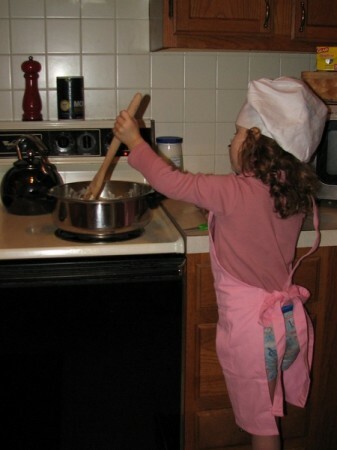 -Knead the dough for about 4 or 5 minutes, or until dough is smooth and elastic. (While you’re kneading, you can get creative and add in some herbs or spices, but only if you want to do that). Be careful not to over-knead the dough. -Form dough into 10 balls. -On a floured surface, roll each ball into a 5-6 inch circle, about 1/4 inch thick. (Be sure to sprinkle a little flour on both sides to prevent sticking). 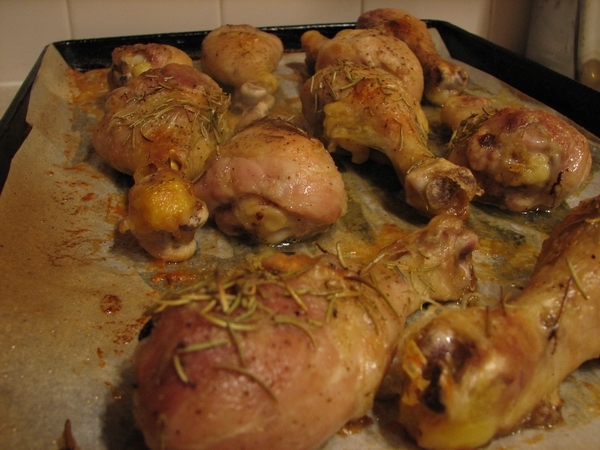 -Place on a non-stick baking sheet and allow to rise 30 minutes, or until slightly raised. 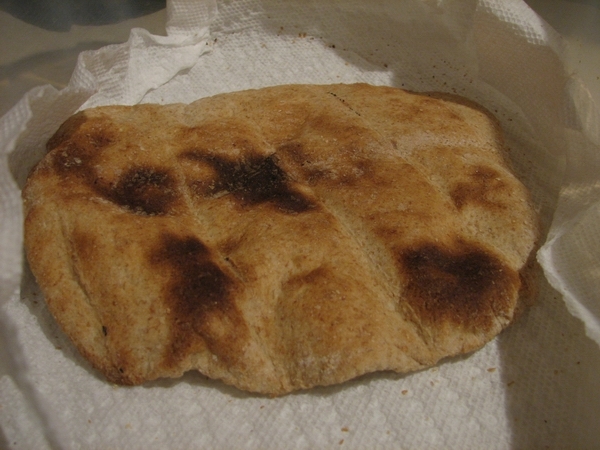 -ust before you place the pan in the oven, flip each pita over on its other side. -Bake on the bottom rack of the oven for 5 minutes. (The instant hot heat will help them puff up). -When the pitas come out of the oven they will be hard, but they will soften as the cool. -Store them, while they’re still warm, in plastic baggies or an airtight container. -Cut the pitas in half crosswise and stuff with your favorite fillings (beans and rice, taco fixings, thick stews, curries – anything goes). -Pitas can be reheated in a 350°F oven or in the microwave. #146 Never give a 3yo unlimited access to “sprinkles” for 2 minutes. 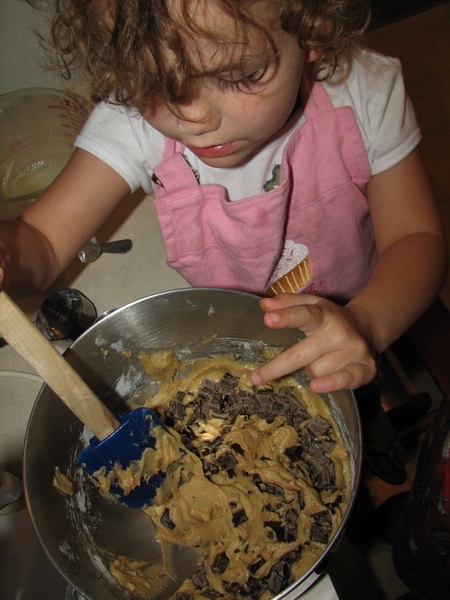 Zora and the neighbor boy were making some cookies and I turned around for a minute. 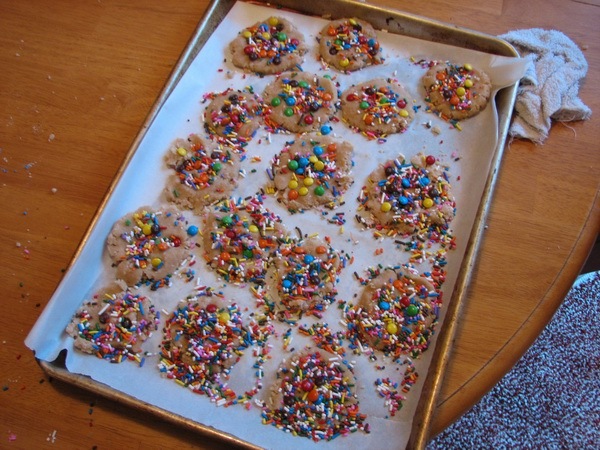 They did 3 cookies, and I took away the sprinkles and spread them over all of the cookies instead of the inch they had on theirs.